Co-op Market shoppers are a conscientious lot. Over the years, more and more of you have made it a habit to avoid waste by bringing your own reusable shopping bags. In fact, according to our recent Shopper Survey, 51% of you say you always bring your own bags, and 28% frequently do. We’re proud to say we’ve never offered plastic grocery bags at the co-op, but we do go through a lot of paper bags: nearly 52,300 last year alone. Those bags, which may be used just one time, often for only a few minutes, cost the co-op more than $13,000 last year. In some ways, paper may seem more environmentally friendly than plastic, which is made from petroleum. But paper bags come with their own (ahem) baggage. Did you know it takes about four times as much water to make a paper bag as a plastic bag? And the fertilizers and other chemicals used in tree farming and paper manufacturing contribute to acid rain and water pollution. Sustainability is part of our mission as a co-op. We are committed to being good stewards of planetary and fiscal resources. For this reason, we’ve decided to start charging 25¢ for paper bags starting Friday, April 5. This charge applies only to the heavy paper bags with handles, and it is the actual cost of the bags, not including freight. Our shoppers who use SNAP will be exempt from the bag charge, as we know EBT will not pay for it. As always, we want to offer options and alternatives. We’ve just set up a shelf in the entryway with cardboard boxes, free for the taking. Use a box. Save a bag! The grocery business generates a huge amount of cardboard waste. By reusing the boxes we receive in freight, you’re helping extend the life of precious resources. We always have reusable shopping totes for sale – including the green Bagitos with our raven and pea logo. Not only are those incredibly durable, but they also hold as many groceries as at least two paper bags. Best of all, they’re made from recycled plastic bottles, and Bagitos donates profit to support environmental education for school kids. Alaffia Fair Trade market baskets, handmade by women in Ghana and Togo of sustainably harvested grasses, make beautiful and sturdy grocery totes. Don’t forget: You can also eliminate single-use plastic bags by bringing your own clean containers for shopping in Bulk. Just ask a cashier to take the tare weight before you fill them. And you don’t have to use a plastic bag for Produce: Bring your own bag – or don’t bag it at all. It isn’t necessary. We’re exploring possible options for a free reusable bag exchange. We hope to set something up as soon as we we get the logistics worked out. To help you with the transition away from paper bags, we’re planning to hold a BOGO sale on our reusable bags. Look for more details soon. Can small acts save the planet? Want to win $100 in Co-op Cash? Tell us what you think. Want a chance to win $100 in Co-op Cash? Just give us your opinions and 20 minutes of your time. 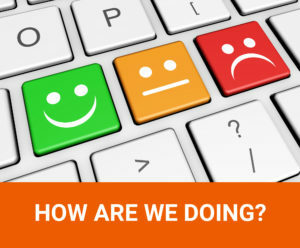 We want to hear what we’re doing well, what needs improvement, and any other comments and suggestions you may have. We’ll ask about your shopping patterns and your satisfaction with the co-op. There’s also a section specifically for Owners and a series of demographic questions that are entirely voluntary. Many questions have space for your comments, too. (If the survey link does not work when you click it, please try copying it and pasting it into your browser. If that doesn’t work, please contact Kristin Summerlin, Marketing & Owner Services Manager, at marketing@coopmarket.org). What do you value about your co-op? When you think about Co-op Market in five years, what do you envision? If you shop at the co-op, our board of directors and management want to hear from you. Our doors have been open for five years now! Before that we spent six years preparing to open. Since opening we’ve grown from $2.5 million to almost $4 million in annual sales. We work with 52 local vendors and are looking for more. We opened our doors because of you. More than 115 co-op Owners made loans to help us open, and more than 3,700 Owners have invested in our co-op through member equity. We will be paying back loans for a few more years, so it isn’t quite time to begin planning for expansion. But now is the time for the board and management to start working on a five- to 10-year strategic plan. Your input will help us hammer out our core values and craft a shared vision. You can help create the framework for making important decisions about our co-op’s future. As part of its strategic planning process, the board is hosting a series of listening sessions. Please join us on one of the following dates for good food and conversation about the future of your co-op. • Sunday, April 22, 5 to 8 p.m.
All sessions will be held at JP Jones Community Development Center, 2400 Rickert Street. For more information on the listening sessions and strategic planning process, please email Anduin McElroy, board chair, or Mary Christensen, general manager. Worried about Sam’s Club closing? We can help. With the announcement that Sam’s Club will close its doors at the end of the month, many people are worried about the negative impact on restaurants and small businesses in our community. We understand the concern and know this will affect not only restaurants and businesses, but also people with large families, those who live in the Bush, and many military families. If you’re familiar with our twice-monthly Co+op Deals flyer, you know that these sales represent significant savings. Did you know you can special order cases of these items anytime during the flyer period and receive the sale price, no matter when the product actually arrives in the store? This is a great way to take advantage of special pricing to stretch your grocery budget. If you’re a fully invested co-op Owner who also owns a small business or restaurant, we can help you source high quality organic and natural products for use in your business. We can offer bulk bags or cases of products, including fresh produce, at our cost, including shipping, plus 20%. If you purchase items for your business from our shelves (rather than ordering by the case), we offer a 10% discount. You can find our business account application here. We do understand the gap Sam’s Club’s closing creates. We also see it as an opportunity to do more for our community. We’re exploring ways to offer even more savings and benefits to bridge that gap. And because we’re a community-owned grocery store, we don’t have outside shareholders who would rather close a store to maximize profit at the expense of community. We belong to you, and we’re here to stay! P.S. Don’t forget our annual Truckload Sale in May! We expect this year’s sale to be even bigger and better than ever! We’re happy to report that our freight is finally moving again, and we’ve been working hard to get the store shelves stocked full. 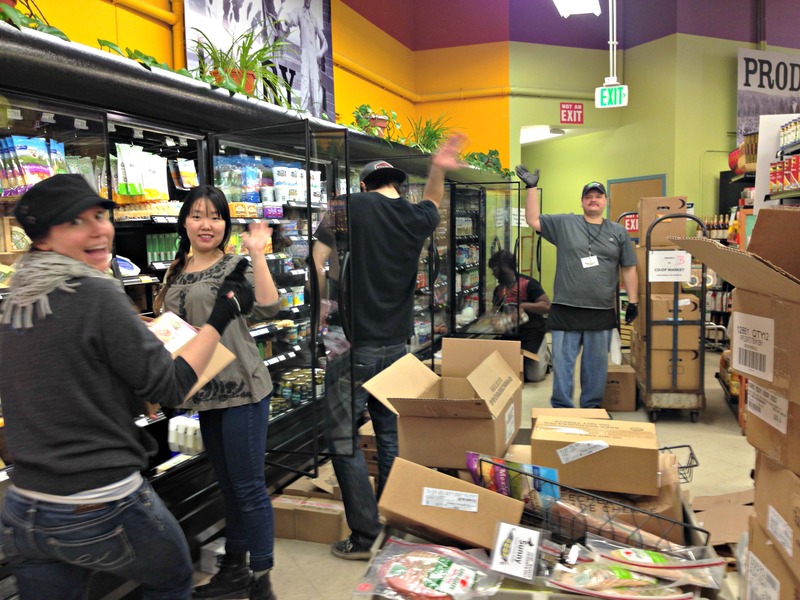 On Wednesday, we received 9 pallets of groceries (as opposed to our usual 3 or 4). Busy stockers are happy stockers! All of Alaska took notice when grocery shelves began emptying out last month. The breakdown of a cargo vessel at the port in Tacoma disrupted food deliveries to Alaska. When other stores were running out of meat, we were stocking our case with local beef and pork. And while we did run low on fruits and veggies, we took the opportunity to deep clean our shelves. We also thought it was important to share information about the shipping delays with our customers. Many people wondered why we were willing to talk to the media when the other stores wouldn’t or couldn’t. It’s simple: Our Owners are our friends and neighbors, not faceless shareholders who live far away. We are a part of this community, and we feel that it is important to share information with the community. You’ve probably heard that 95% of our food must be barged and trucked in from Outside. It’s estimated that we have a 7-day supply of food in the state. Now that deliveries are getting back to a more normal schedule, it’s time to think about the implications. How can we Alaskans be more food secure and self-sufficient? Support your local farmers. When you buy locally grown food, our farmers grow more of it, and we all benefit. Learn to preserve food when its abundant, whether by freezing, canning or pickling it. The UAF Cooperative Extension Service is a great resource. Keep a good supply of long-lasting staples on hand, such as rice, dried beans, powdered milk, canned goods. Grow your own garden. It will soon be time to start your seeds. Learn about where, when and how your food is grown and how it gets to you, so that you can make conscious, informed decisions about the things you buy. Co-op Market exists, in part, to provide a viable marketplace for local agriculture, and we are doing that. Alaskans do love Alaskan products, and demand can quickly outstrip supply. For example, we sell out of local eggs almost as soon as we get them. We would sell more if we could get more, but many small producers can’t afford to follow packaging regulations and other food safety rules. We need to find a way to build an agricultural infrastructure to make this easier and less expensive. With the help of a USDA grant, we will soon begin work with UAF on a study to determine the feasibility of a mobile poultry processing facility. Such a facility would make it possible for us to sell local poultry at the co-op. Without a certified processor in Alaska, we currently cannot do this. As a co-op, we believe that cooperation may hold the key to many of our food supply issues in Alaska. Local farmers could join together and create a cooperative kitchen certified for commercial use. Sharing the costs, farmers could create value-added goods, such as frozen fruits and vegetables. This would expand the market: We can’t buy and sell these goods unless they’re produced in a certified facility. Seeing empty shelves in the stores was a shock to many of us. But it was also good for us. More Alaskans are aware of food security, and we’re talking about it. This is how change begins. At the heart of every cooperative is the desire to build common ground for member-owners and customers regardless of their backgrounds and beliefs. Co-op Market Grocery and Deli is no different. We welcome everyone. It is also important to understand that as operators of a successful business we work to choose natural and organic products we think our customers will want to buy. We welcome comments and suggestions. Anyone can fill out a comment card at the customer service counter and we will consider these suggestions in our decision making. At the end of the day our board of directors has delegated operation to a management team focused on making good buying decisions to serve the needs of our member-owners. Sometimes people ask us to stop carrying products that other people want to buy. This makes decision making a little harder. When faced with such dilemmas I believe that it is important to consider what is most important to our co-op and why did we set out to open this store to begin with? Probably our most important goal throughout the development years was improving the local economy. Another goal is providing our member-owners with the healthiest and freshest food possible. We also want to be both economically and financially sustainable. Finally, we care about our community. We are proud of the work we are doing to create local economy, especially in our meat department. This week we are increasing the amount of local beef we buy and we’ve added local pork. Reindeer, goat and buffalo are regular offerings. All of our fish and seafood is wild caught in Alaskan waters. Our chicken is from our neighbors in Washington (since there are no poultry processing facilities in Alaska). Soon we’ll see more and more local produce. Last year local produce accounted for 35% of produce sales. This year we hope to increase that to 51%. Local eggs have just hit the shelves and we hope to offer more. (Call our fresh foods buyer, Steven Vandermaas, at 457-1023 Ext 104 if you have local eggs to sell.). We offer coffee from two local vendors – Diving Duck of Fairbanks and Kaladi Brothers of Anchorage. You’ll also find local ice cream and milk and many other local products in our aisles. Possibly our most delicious local food comes right out of our own kitchen! Our talented chefs create amazing soups, salads and sandwiches using local meats and seafood and fresh organic vegetables. Many vegetarian and vegan options are available as well. Currently we are looking for a double soup warmer so that meat eaters and vegetarians can both find the soups they crave. Perhaps our most important goal is sustainability. How do we provide our community with a financially sustainable community grocery store that thrives for years to come? This was the question I was working on when the debate over Ms magazine came to my attention. We have recently joined National Cooperative Grocer’s Association and a Development Advisor spent a week here helping me to assess how we need to improve operations. We’re excited about the opportunity NCGA offers us. Coming in June you will see Co+op Deals throughout the store. You might even get a coupon book or sales flyer in the mail. NCGA also helps us to offer education, recipes and information about natural foods. Concern for community is another goal near and dear to us. Last fall we started the popular Lend a Hand program that gives you the opportunity to round up at the register and help your favorite charity. Our member-owners and customers donated over $1500 to both Stone Soup Cafe (Breadline) and the Foodbank. As cooperators we do not represent one political agenda. When we offer reading material that we think people will want to buy that does not mean that the opinions represented in the magazine are ours. We strive to offer a balance of reading material that interests our customers. You will find food, farming and exercise magazines, literary magazines, and both the New Republic and Ms. While we welcome suggestions, our professional staff makes the buying decisions for our store. We will not be voting on what magazines (or other products) to carry but ultimately, for member-owners, the best way to vote is by buying the products you like. Again, what matters most at our co-op? Local economy, healthy food, sustainability and community. Interior Alaskans often picture themselves as self-reliant individuals, growing huge cabbages and putting a moose in the freezer each fall. Growing produce in the long days of summer and gathering from the bounty of nature indeed can be productive, spiritually rewarding, and economical. However, the reality is our population as a whole imports a high percentage of its food from outside the state. With only an estimated 10-day supply of food in warehouses, Alaska is vulnerable to a prolonged disruption of the long-distance transportation network on which we rely daily. Rising cost of fossil fuel will impact food production and transportation prices. Relying heavily on outside sources means we are also at risk when one of the few major producers has contamination that can manifest widespread effects on many people, even if caught relatively quickly and recalled. U.S. policies favoring inexpensive food after World War II included price supports for commodities (foods, fuels, and fiber crops, such as cotton) and low taxation on fossil fuel, which is also a feedstock for fertilizer and pesticides. The cost of food as a percentage of annual income has steadily declined in the industrialized world during the 20th Century. Today Americans spend only about 10% of income on food. However, the “savings” come at a price to the environment (chemical loads, water use) with consequences to international policy on energy (including military engagement), immigrant labor, and trade—externalities that don’t show up on the label in a grocery store. A local system of food production and processing for storage capability in Interior Alaska, if it (likely) does not qualify for price supports enjoyed by “industrial” agriculture Outside, would be more expensive to consumers because it would reflect more of the true costs. However, what is the value of not being so vulnerable to a disruption of transportation, such that shelves of major grocery stores begin to go bare when trucks or barges are delayed for just one day? What is the return on your dollar spent when you can see it remain in the community, providing jobs for producers, processors, and grocers? How much are you willing to pay for supporting a local food system has to be more accountable because it is composed of your neighbors, not a faceless entity thousands of miles distant with many corporate fingers taking a cut between the grower (doing the work and taking the greatest risk) and the supermarket? The mantra of industrial process is increased efficiency, which indeed can help feed the world—if consumers can afford the shipping. But heavily mechanized production means high start-up and operational costs for younger people with the urge and skills to produce food. To quality for many of the federal cost share programs you need to have the private money or loan collateral up front–a Catch 22 for young families. Alaska is highly unlikely in our lifetimes to produce all the food needed by our growing population approaching ¾ of a million people across a vast area, some of which is unsuitable for agriculture or livestock. However, trials a hundred years ago at various locations across the state demonstrated a high potential for growing food on relatively small areas with intensive labor—something young aspiring farmers can handle. There are incredibly resourceful producers of crops and livestock in the Interior right now, growing for personal consumption and maybe a little at the farmer’s market or customer shares. Our collective challenge is to help them scale it up! I envision Fairbanks Community Cooperative Market as one venue that can help with food security by providing a reliable local outlet for many smaller producers. We can still buy the more exotic foods from far away, but we can buy a lot more of the basics much closer to home. There will be a presentation by Ritchie and Mike Musick on The Natural Step for Communities, discussion afterwards, and a second presentation and discussion at 7:00 pm on food security and sustainable agriculture.